After a 2-year-long collaboration endeavour the EBCL Project finally embraced the moment to share its outcomes with a wider community of stakeholders and professionals committed to developing Chinese language learning and teaching in Europe – the European Symposium on Benchmarking Chinese Language was held at Brussels, Belgium, thanks to Prof Piet van de Craen from Vrije Universiteit Brussel, between 19th and 20th October 2012. Day 1 of the European Symposium was meant for presenting the project outcomes to invited stakeholders and experts from related areas to the EBCL Project, who were expected to discuss about and comment on the outcomes. After an opening welcome and introduction by Prof Anne Pauwels and Prof Wolfgang Mackiewicz, Federica Casalin (on behalf of Prof Federico Masini) and Prof Jöel Bellassen reviewed the overall project with regard to background, description, achievements and challenges. A particular emphasis on the uniqueness of the Chinese language in the project was highlighted in terms of its significance and challenges. The Panel consisted of four experts from different academic backgrounds to comment on the project products. They were Emeritus Professor Mike Byram (Durham University, UK), Professor Henning Klöter (Johannes Gutenberg-Universität Mainz, Germany), Dr Valerie Pellatt (Newcastle University, UK) and Madame YIN Wenying LEFEBVRE (IA-IPR de Chinois, Inspector of Chinese Pedagogy, Paris Rectorat). Day 2 was an open day event for the participants from across Europe to discuss, comment on EBCL project outcomes and make suggestions for improvements. It started with Prof Bellassen’s brief introduction of the project overview, followed by two project team-led sessions delivering the detailed methodology for creating descriptors and their related components, among which, two important issues were well communicated – graphemic control and lexical/character control. While the participants were greatly impressed by the quality and quantity of the work the Project teams had contributed, they enabled the communication much interactive by offering constructive comments and suggestions. The heated panel discussions and questions and answers on both days were brought into a list of issues both as challenges and suggestions for future actions. 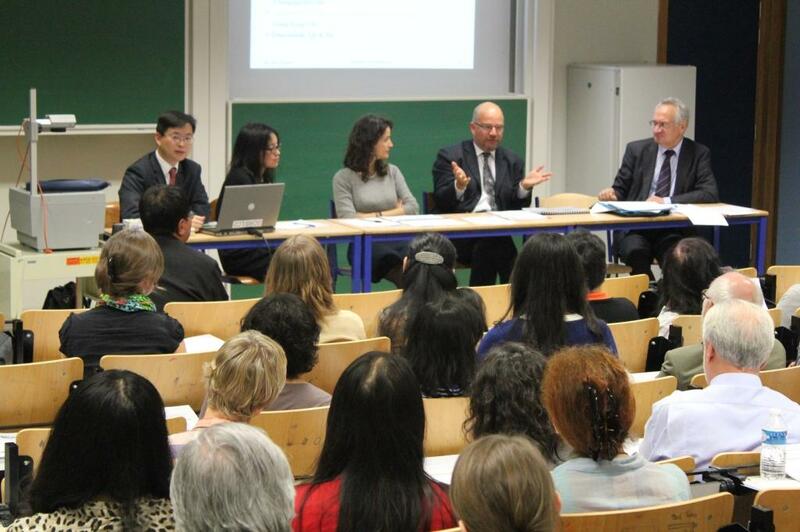 The Symposium at such a scale proved valuable and gave a great impact on the promotion of the Chinese language learning, teaching, assessment, and policy making across Europe. A total of over 50 participants attended the Symposium, mostly from countries including France, Germany, Italy, Belgium, the Netherlands, Switzerland, and the UK.